Purpose: The purpose of the study was 1) to assess the periodontal condition of a population of early menopausal women and 2) to investigate the relationship between these and other variables such as demographics, oral hygiene and clinical variables. Material and Methods: A cross sectional study was developed at the outpatient section of a gynaecology department of a hospital in Seville, Spain, during one year. A sample of 67 menopausal women were periodontally evaluated. The periodontal variables studied were plaque index (PI), probing bleeding index (PBI), gingival level (GL), probing depth (PD) and clinical attachment level (CAL). The relationship with other demographic variables, oral hygiene and clinical variables were evaluated too. The statistical test used was ANOVA with post hoc test Bonferroni, multiple regression analysis and ANCOVA. The significance level was p<0.05. Results: The mean of PI was 69.3±3.07%. The PI was statistically significantly increased when frequency of brushing was lower (p<0.025) and previous dental care was less frequent (p<0.0033). The mean of PBI was 36.5±3.35%. The PBI was significant in relation to higher tobacco consumption (p<0.024) and a less frequent previous dental care (p<0.014). The mean of GL showed a gingival retraction of -0.83±0.07mm. The GL was significantly reduced in hypertensive patients (p<0.017), in those on antihypertensive treatment (p<0.0097) and in those who had had more than two previous pregnancies (p<0.0358). The mean of CAL was 3.24±0.1mm. The CAL was significantly reduced in individuals who smoked five to 20 cigarettes a day (p<0.005). The mean of PD was 2.5±0.05mm. This PD was correlated significantly with smoking five to 20 cigarettes a day (p<0.0003). One-Stage, Full-Mouth Disinfection: Fiction or Reality? Recent research indicated that periopathogens colonize, besides the pockets, also other niches within the oral cavity including: the soft tissues, the saliva, the tongue, and even the tonsils. Since the supragingival plaque and the bacteria in these niches have a major impact on the subgingival plaque colonisation but especially on the recolonation after debridement, it seems reasonable to expect that a one-stage, full-mouth disinfection protocol, involving the bacteria over the entire oro-pharyngeal area, has a significantly better outcome when compared to a more staged approach (e.g. with treatments per quadrant). Since several review papers recently discussed the benefits of a one-stage, full-mouth disinfection protocol, pointing to some shortcomings in the our research protocol or with an attempt to compare the data of the new approach with other studies (with unfortunately non comparable approaches), this review paper aims to clarify some of the confusion concerning the benefits of a one-stage, full-mouth disinfection approach. Purpose: The aim of this study was to determine if self-reported anxiety had an association with gingival inflammation and attachment level (AL), and with the amounts of prostaglandin E2 (PGE2), interleukin 1ß (IL-1ß) and elastase in gingival crevicular fluid (GCF). Material and methods: The participants were 51 subjects with adult chronic periodontis (26 men and 25 women), with a mean age of 53.5 (±2.9 SD) years (48-57 years). The subjects were clinically examined and answered questions regarding anxiety in everyday life, as well as smoking habits. GCF was collected with an intracrevicular washing technique from four sites in each subject. Analysis of variance (ANOVA) and non-parametric Mann Whitney U-test were used as the statistical methods. Results: Anxious smokers had an average GI of 2.1 (±0.7 SD) compared to the non-anxious smokers 1.3 (±0.9 SD), p<0.05. Attachment loss was significantly more pronounced in anxious smokers than in non-anxious smokers, p<0.05. No association between self-report anxiety and inflammatory markers in GCF was found. Conclusion: The present study showed no differences between anxious and non-anxious subjects with periodontitis in relation to the range of biochemical inflammatory markers. Anxious smokers had significantly more gingival inflammation and attachment loss than non-anxious smokers. This case report will show the potential of space provision for bone regrowth underneath a nonresorbable barrier device in a recession defect where the concept of cell exclusion was intentionally neglected. A deep and wide gingival recession defect associated with a 10mm-deep bone dehiscence was treated by a coronally advanced flap in conjunction with a titanium-reinforced ePTFE membrane. At the time of membrane positioning, the device was intentionally perforated to allow for tissue ingrowth and colonization of the space between the membrane and the root surface by means of cell lines that are usually excluded under GTR provision. Clinical evaluation after tissue maturation phase revealed a substantial bone regeneration and attachment gain onto the previously exposed root surface, which were maintained long-term. A 47-year-old patient presented at the Department of Periodontology of our Dental School with severe chronic periodontitis. Periodontal examination revealed probing pocket depths (PPD) and clinical attachment loss (CAL) of more than 10 mm in several teeth. A total of 28 teeth were present, with 26 teeth showing PPD > 5 mm with bleeding on probing (BOP). Molars presented with furcation lesions class I and II. Additionally, poorly contoured restorations were present. Oral hygiene instructions and motivation were performed in order to reduce the plaque and papillary bleeding indexes. Subsequently, and prior to scaling and root planing (SRP), a subgingival controlled release of chlorhexidine (PerioChip®) was performed on all teeth with PPD > 5 mm for a total of 10 days. Afterwards, a full mouth SRP was conducted by a experienced dental hygienist. Periodontal parameters were assessed again after four weeks and three months. Controlled local delivery of disinfecting agents has been demonstrated to be efficient in improving the outcome of periodontal therapy. The use of PerioChip® as an adjunctive to scaling and root planing (SRP) has been reported to improve the result of local therapy. In this study, the effect of the chip on clinical and microbiological parameters prior to SRP was analyzed. The following clinical parameters - probing pocket depth (PPD), attachment level (AL) and bleeding on probing (BOP) - were recorded at six sites/tooth in 14 patients with chronic periodontitis. Subgingival samples were collected from the deepest periodontal pocket (total: 56 sites) and analyzed by means of polymerase chain reaction (PCR). Chlorhexidine chips were then inserted into these pockets and the clinical and microbiological recordings were repeated on the 10th and 28th day post-placement. At baseline, Porphyromonas gingivalis (P.g. ), Tannerella forsythia (T.f. ), and Treponema denticola (T.d.) were the most frequently detected pathogens (95%, 98% and 81% of sites respectively). The use of PerioChip® resulted in significant (p<0.05) clinical improvements (mean PPD reduction: 0.96 mm; reduction in the percentage of bleeding sites: 53%) and in a significant reduction in the frequency of P.g., T.f. and T.d. (95 to 15%, 98 to 35% and 81 to 11%) respectively. It is concluded that the local disinfection of periodontal pockets with PerioChip® prior to mechanical therapy is effective in reducing putative pathogens in the pockets and also in improving clinical signs of periodontitis. However, sole use of PerioChip® without subsequent SRP cannot be recommended. In February 2005 the Philips Oral Healthcare Company organized an outstanding international symposium entitled 'Emerging trends in oral care', which was held at the Grand Hotel Schloss Bensberg in Cologne, Germany. In contrast to other symposia organized by industrial partners, this meeting focused very much on research and clinical science rather than product marketing. 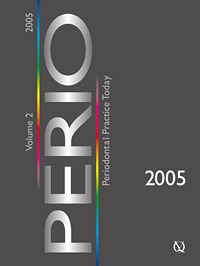 Since the presentations given by internationally well-known experts in the field of periodontology are of fundamental importance, it was decided by the editorial board to include short versions of the keynote lectures in the form of an extended congress report in Perio. Thus not only the participants of this outstanding symposium, but also the readers and the subscribers of Perio, can benefit from the excellence of these presentations. Predicting reliably which of our patients will develop periodontitis remains an elusive goal for periodontists. As clinicians, we would greatly desire to be able to perform a simple diagnostic test that would indicate, with adequate sensitivity and specificity, which of our patients are at greatest risk for developing disease. In order to develop and validate such a system, large scale longitudinal clinical trials would be required. This concept was explored at a break-out session of the recent Philips Oral Healthcare Emerging Trends Symposium in Cologne. The discussion, while not scientifically rigorous, was lively and imaginative and led to the development of an idea for the 'perfect clinical trial' which was interpreted by the participants as the clinical trial that they would best like to undertake. Such a trial would aim to develop a method for identifying patients at risk for periodontitis before they actually demonstrated clinical signs of the disease. The discussion focussed on ideas rather than detail about process, and the participants realised that this study, while very desirable in concept, would need a great deal of thought, planning and preliminary experimentation before it could become reality. All of these issues would impact on the practicality of undertaking such a study, which would require significant funding.